A bill soon to be introduced in the General Assembly with the support of unions of people working on railroads would prohibit freight trains traveling on North Carolina’s 3200 miles of train tracks from being operated by fewer than two individuals – a certified Conductor and a certified Locomotive Engineer – as a matter of public safety. 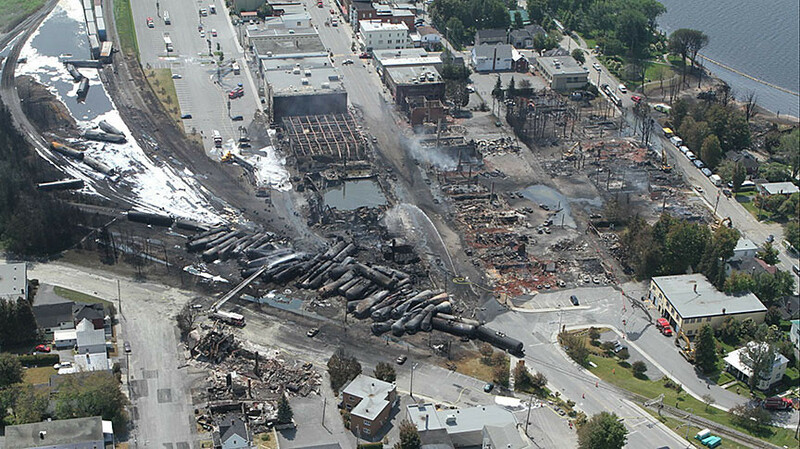 On July 6, 2013, a runaway freight train carrying crude oil through Lac-Mégantic, Quebec, derailed and exploded, instantly killing 47 people and destroying the town. The train rolled away because its single crew member could not properly secure it by himself. What happened in Lac-Mégantic could have happened anywhere freight trains operate in North Carolina, including in the downtowns of heavily populated cities like Raleigh and Charlotte. Freight trains are typically one to three miles long and carry the most hazardous materials and dangerous chemicals directly through our communities. They can frequently stop unexpectedly. Safe operation of these trains requires two crewmembers to open blocked rail crossings, make repairs to the train, and if needed, be the first-responder in case of a derailment and/or chemical release. Train engineers and conductors are each responsible for a long list of unique duties, most of which must be carried out simultaneously for safe and efficient operation. Two-person crews not only help prevent potential accidents or derailments, they play a critical role in emergency situations, and having a two-person crew is one of the most effective ways to combat the most critical safety issue facing the rail industry today, operator fatigue. While the railroad industry claims that the implementation of Positive Train Control (PTC) systems can allow them to safely operate train with a single crewmember, it is simply untrue. PTC cannot be a first responder, see potential security threats, or physically secure trains. These operations require two people – no fewer. Federal legislation to prevent what happened in Quebec from happening here went nowhere when it was introduced in Congress after the disaster, so it will be up to state lawmakers to prevent the railroad industry’s pursuit of higher profits through automation and labor cost-cutting from endangering the public’s safety. Unions of people who work on railroads, including SMART, are working hard to gather co-sponsors for the North Carolina’s “Regulation of Railroad Crews” bill, but legislators want to hear from their constituents. In order to win passage of the “Regulation of Railroad Crews” bill, we must get everyone’s involvement – yourself, your family, and your friends. Write a letter to the editor of your local paper, and write to your lawmakers. Click here for a template (Word). Visit your lawmakers in Raleigh or when they come home. Attend city and town council meetings to call on your local government to adopt resolutions in support of this bill. For questions or suggestions on how you can help move this critically important bill, call Ron Ingerick, Jr., NC State Legislative Director for SMART’s Transportation Division, at 828-242-9576. Two  persons per train is a good way to go!